Is it necessary to buy two of everything for the nursery if your having twins? Q: We're having twins. Must we buy two of everything for the nursery? A: "Buying double of everything is a big mistake," says Annette Tatum, owner of House, Inc., a collection of fine baby linens, furniture and accessories that can be purchased at her flagship retail shop, Little House Boutique, in Santa Monica, Calif., and online at houseinc.com. Even at its most basic, your twins' room will require a pair of space-occupying cribs, so Tatum suggests adopting this pragmatic game plan: Stick a dresser in the closet and buy a single diapering station because, she says, "It's not possible to change them both at the same time unless you're an octopus." She also recommends asking yourself, "What are the needs of this room going to be in a year?" You may not buy in multiples, but there's no way to avoid acquiring double the amount of gifts, toys, clothes and so on. 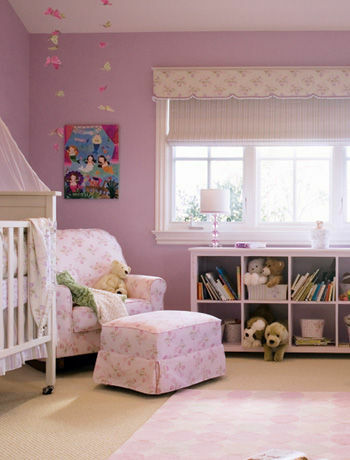 For Desperate Housewives star Marcia Cross' twin daughters, Savannah and Eden, Tatum designed a lilac nursery with a toy shelf that does double duty as a lamp stand, and nothing in the middle of the room but a simple pink polka-dot area rug, to allow room for crawling and toddling. When they're 1 or 2 years old, that's where you can put little chairs and a table or whatever else feels right, according to Tatum. "This is important, especially with twins: You don't know your babies yet. You want to leave room for distinction between two separate personalities."